Are you overwhelmed with busyness in your life or in the lives around you? Do you ever wonder what it would be like if everyone could just slow down? I used to be really busy. I felt like I was rushing through each day simply reacting to the demands of life and work. I was making plenty of decisions but somewhere along the way, I forgot I could choose how I spend my time and energy. There were times when I thrived on my busyness, times I measured my worth based on how busy I was, and then other times when I completely resented my busy life. The best and worst part about being busy was that I didn’t have time to listen to what my body needed or what my heart wanted. I didn’t hear those voices at all. I didn’t have to make any changes because I was simply too busy. I ignored wake up call after wake up call and in the process, I compromised my health, happiness, and my best relationships. Whoever hands out wake-up calls must have known how busy and stubborn I was, because they finally gave me one I could not ignore. In 2006, my body said enough is enough. It said enough to the stress, the rushing, the worry, and the busyness. After months of vertigo, fatigue, and other symptoms, I was diagnosed with Multiple Sclerosis (note: I don’t believe my busyness caused my disease, but it definitely exacerbated the symptoms). Once I learned the role stress and busyness played in my declining health, I decided to put an end to as much of it as possible. We all get wake-up calls when we are running ourselves into the ground, or running away from how we really want to live. Those are only a few, and you can probably identify a handful of your own. 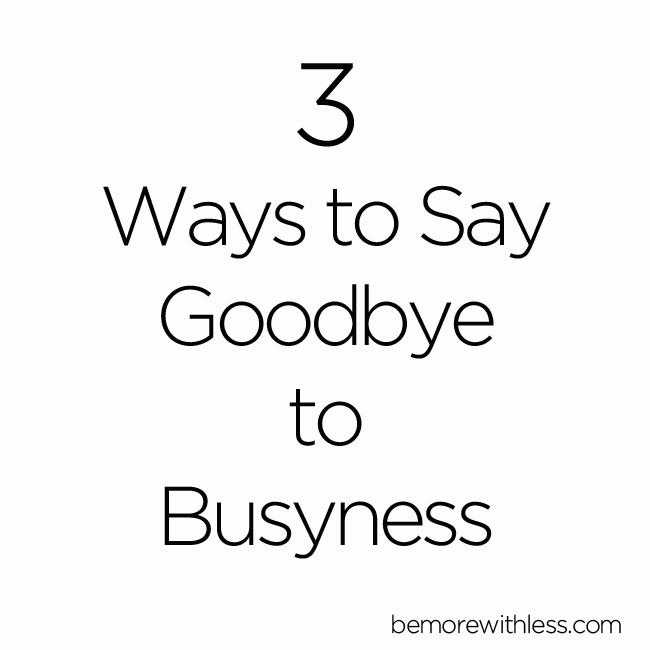 Instead of waiting for one more shake up or wake-up call, take a stand and try one of these 3 ways to say goodbye to busyness. Sleep: If health were more important than busyness, we’d never sacrifice a night of sleep in the name of getting more done. You may hear friends or co-workers brag about how they stayed up all night working, or maybe you’ve done it yourself. I know I have. It’s a sign of our commitment to our work in some corporate cultures, but it also gives three sheets to the wind a whole new meaning. According to reasearch published in the Harvard Business Review, “the effect on performance of even a moderate level of fatigue is equivalent or greater than what is considered acceptable for alcohol intoxication.” It may feel like you are getting more work done, but sleep deprivation does not result in better work, or more thoughtful work. And, it contributes nothing to a healthy lifestyle. Protect what matters: Identify the 2 or 3 things that matter most to you and start making decisions that support those things. If your family matters the most, demonstrate that by showing all the way up for them. Put your cell phone away, look them in the eyes, appreciate them, and show them you are really there. If creative work is at the top of the list, make time for it and if taking care of yourself is a priority, do it first, every morning. Create boundaries that you will honor and protect. There is a saying that goes something like, “If you want to get something done, ask a busy person.” If you’ve been that busy person, chances are people are giving you their to-do lists. A good sign is if an email starts, “I know you are busy but …” Take a good look at your commitments, and what you really have time for. If you are overextended, or doing work that doesn’t support what matters to you, make a change. Unschedule: Start saying no and reschedule your busy schedule to allow time for doing nothing, time to take a walk, or time for the unexpected. Make room for what matters to you. 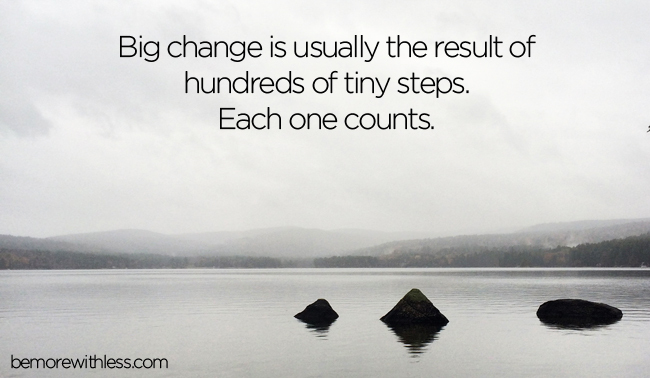 A new schedule might not emerge overnight, but big change is usually the result of hundreds of tiny steps. Each one counts. Thanks, Courtney. This is an important message and I’m glad you give not only encouragement, but also practical advice. I appreciate the efforts you put into your work–you help us to become better people. Thank you very much for this article, Courtney. I think this is a critical message that needs to be heard! Busy =/= successful. I think so many of us feel like if we have free time that we should be doing more – we pack our schedules until they are overflowing, and pay in stress and illness. I also used to be busy until my body forced me to stop. It would be wonderful to prevent others from having to go through something similar. Thanks again. Interestingly this comes on a day when I have a headache, flu, and really busy schedule. The first management rule I learned was I was not paid to be liked, and I had to learn to say no. I am a very organised person and when my children were at school very busy, but you must remember the above rules when you are doing voluntary work, or you will never have time for your family. Allow enough time to smell the daisies. I only realised that when I got older. I used to go by sleep is for the weak – not anymore! Can’t agree more, you have to focus and protect your time.